Thrillers are my favourite book genre and I have read a good variety over the years. 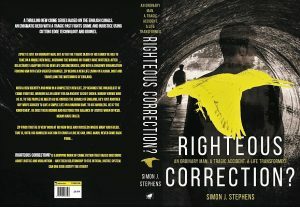 One thriller that I have read recently is “Righteous Correction?” by Simon J Stephens. 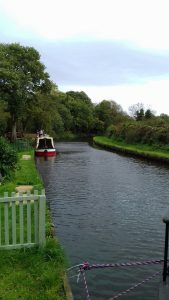 Without giving too much away, it is a crime fiction that takes place on the English canals, one that raises questions about justice and vigilantism – and their relationship to the official justice system. Apart from the main storyline, the book describes the canals with such vividness that you could close your eyes and imagine being by the canal side, pint in hand! So it will come as no surprise that the author, Simon Stephens, lives aboard a canal narrowboat in Staffordshire. 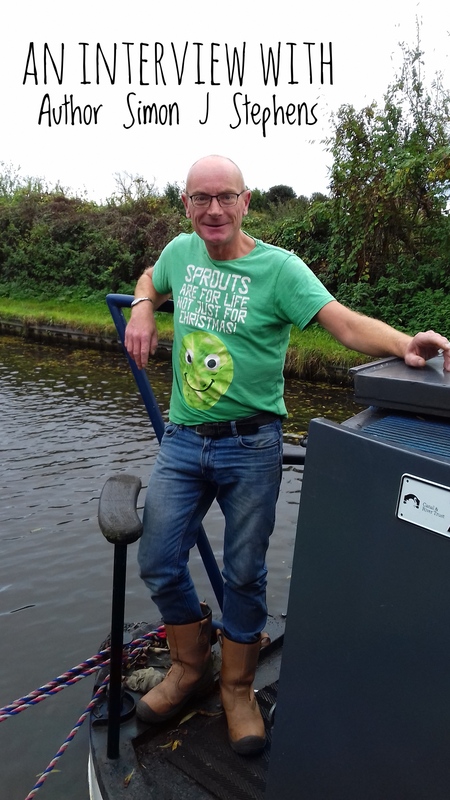 I caught up recently with Simon to find out more about his writing and his life on the waterways. Hi Simon..
Hello! My name is Simon J Stephens and I am an aspiring author who lives on a narrowboat with my wife and three dogs. 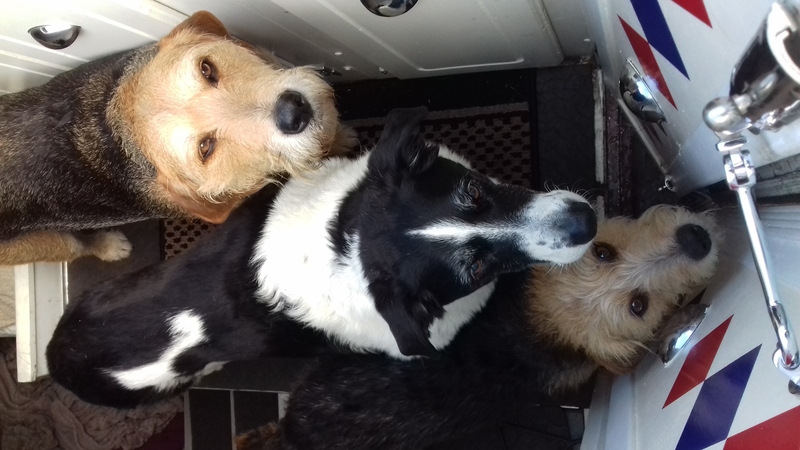 As the boat is only 15 metres long, we are definitely at full capacity just now, although if another rescue hound comes our way, I guess I’ll be camping on the towpath! We’ve lived on a boat for five years, prior to which I’d spent my working life in retail, driving 40,000 miles a year, looking after up to 70 stores, taking phone calls 24/7, and loving every minute of it …until I didn’t. I suddenly decided that life was too short and that I was stuck on a roller coaster, so, I jumped off, and we’ve never looked back. I still have to work but I just do a few nights in a hotel which is a nice, stress free way to earn just enough. 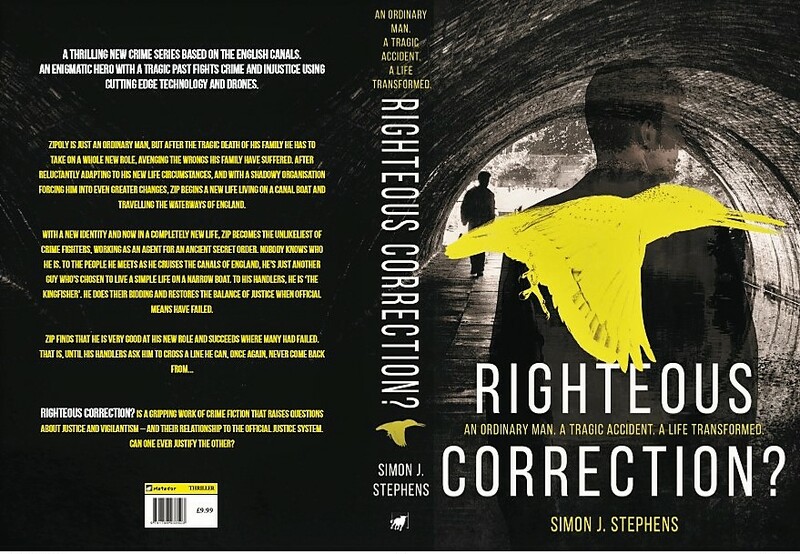 “Righteous Correction” is your latest crime thriller that raises questions about justice and vigilantism – and their relationship to the official justice system. 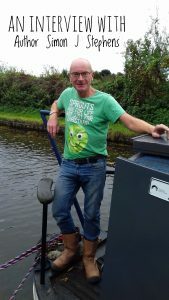 The main character, Zipoly, lives on a canal narrowboat and to all intents and purposes is an ordinary chap – but not all is as it seems as he is an agent for an ancient secret order. So, having worked in the retail sector for most of your working life, what was behind the inspiration to turn author and write a thriller? Writing has always been a key part of my life and, interestingly, played a part in my retail career with training manuals and weekly newsletters being a part of the job that was most satisfying. I wrote my first full-length children’s books when I was seventeen, have written another half-dozen novels whilst in-between jobs and, for the last fourteen years have written hymns every day (just about to hit the 10,000 mark!). 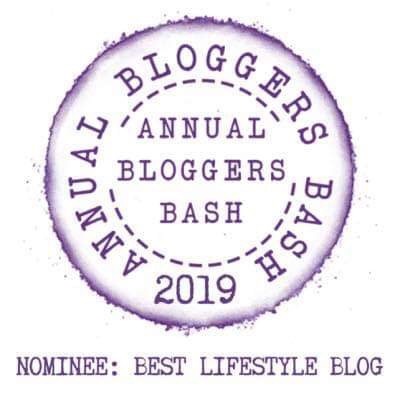 With moving onto the boat, I found myself both time-rich and with the opportunity to write about a world and a lifestyle that is very English and very special. Along came ‘Righteous Correction?’ and, for the first time, I really felt that it was of sufficient standard that it should be published. Since then, I have written two sequels to that and a very different thriller which I’m seeking an agent for. The canals are incredibly inspiring, but Righteous Correction? was also inspired by a desire to find a way to make a living off the boat and by ideas that come when you have time to stop and think about big issues like justice and futuristic concepts such as drones. There’s a bit of all that in the novel. 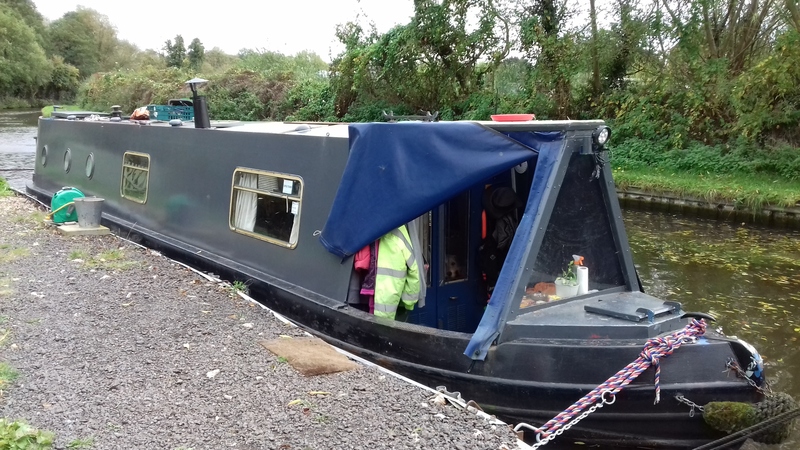 Living on a canal narrowboat yourself and cruising the waterways of Staffordshire and the Midlands, you are able to bring your book to life in your detailed and vivid descriptions of canal life – which I feel is important and immerses you into Zipoly’s world. If you could visit any place in the world to write another thriller (money no object! ), where would you go and why? I know that this sounds really odd, but nowhere in the world can match the canals and there isn’t anywhere I’d hanker to visit. I was able to travel the world a little in my retail career and I’ve seen more than enough of airports. That said, if money were no object, I’d spend five years covering the inland waterways network of Britain. If “Righteous Correction” was made into a film, which actor (dead or alive) would you cast as Zipoly? The main character in Righteous Correction? undergoes a physical transformation as he progresses in his role, and I can see Jason Statham as the perfect actor to play the transformed part. Can I also request Guy Ritchie to direct please? As a child, what books did you enjoy reading? What genre of books do you enjoy reading now? As a child I progressed from Paddington Bear to the Hardy Boys, with Dr Zeuss in there and lots of factual books. Now, I read anything I can get my hands on and am lucky to be able to get through two or three a week. Any mainstream thriller is a nice snack for me, but I love picking up unusual factual books on any subject at all. Ken Follett is a firm favourite and I’ve just finished the third Kingsbridge novel which came out last month. As much as you like writing thrillers, is there any genre you would like to dabble in that you haven’t yet tried? I’ve just done a children’s book which was fun- ‘Alf, the Bear’ is a retelling of the Prodigal Son story, written for adults to read to children. I’d like to do more like that. I’m also planning to write a comedy, but that’s brewing at the moment and it looks like the next one will be a thriller again. When you’re not writing what hobbies/past times do you participate in? I’ve discovered this great hobby called ‘living’! 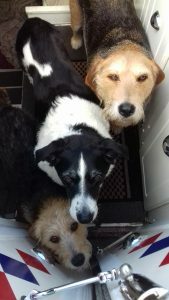 When I’m not writing, I’m reading, taking the dogs for a walk, relaxing in the pub or cruising the boat. What else could I ask for? It never changes – T-shirt, jeans and rigger boots or trainers – I’m a child of the Eighties and coming back on trend just now! I am a great fan of Amazon as an online business (tax affairs aside). As to bricks and mortar shops, I don’t venture out too often but when I do it’s to the big new discount sheds – I love to browse away in B&M and Home Bargains! My favourite retailer, although I don’t use them often, would be Timpsons – just a great, ethical business. Think I need to upgrade the Wickes rigger boots to a decent pair of Timberlands. Boots. Safer, dryer, longer-lasting, better looking and nobody can see if your socks don’t match! 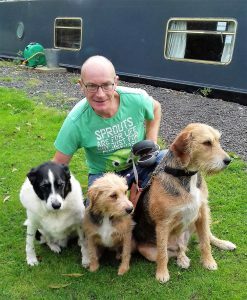 Life on the narrowboat certainly sounds idyllic and is a dream that some members of my family also hope to pursue in the near future. Thank you for chatting with me – I loved the book, Simon, and I’m sure your crime writing will continue to flourish. I’m really amazed at your hymn writing – bizarrely enough, I always think of hymns being written by people in the 19th century – a pleasant surprise! So, dear readers, do you love thrillers? 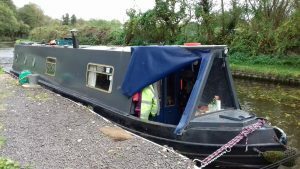 Do you live on a narrowboat or have a dream to do so? Do share your thoughts, don’t be shy, I’d love to know! All photos published with kind permission of Simon J Stephens.